My Barbara Pym FB group; The Barbara Pym virtual tea party are currently reading Barbara Pym’s first published novel; Some Tame Gazelle. It was my third reading of it, and I enjoyed it every bit as much as I did the first two times, perhaps even more so. As so often happens with re-reads I found myself struck by things that I either hadn’t noticed before or had forgotten. Although not published until 1950 – it was written much earlier. Famously, Pym based many of her characters on herself, her sister and their circle of friends at Oxford – imaging how they might all end up in middle age thirty years in the future. Belinda and Harriet Bede are spinster sisters in late middle age, living together in a tiny English village sometime during the first half of the twentieth century. Each of the sisters is preoccupied by local clergy, Harriet by ministering to a series of pale young curates who live in lodgings nearby and for whom she knits socks and makes apple jelly, and Belinda for the pompous self-important Archdeacon Henry Hoccleve who she first knew thirty years earlier. The Archdeacon is a wonderfully comic creation, a pompous man quite undeserving of Belinda’s silent devotion. His sermons only confuse and worry his parishioners and he is rather too fond of the sound of his own voice, quoting at length obscure and worthy poets. Belinda’s rapturous loyalty to Henry and her dislike of his wife Agatha is a full-time occupation. Harriet’s time meanwhile is taken up with wondering whether it is too soon to invite the curate to supper again, and gently fending off marriage proposals from Count Ricardo Bianco – a regular event she has come to depend upon. Harriet is the more glamourous of the sisters, taking great pains with her appearance, enjoying the effect of new clothes. Belinda is more flat shoes and comfortable old coats, and she often compares herself unfavourably with her more attractive sister. When Henry’s wife Agatha goes on holiday for a month without her husband it heralds small changes in their community. Belinda and Harriet are quite devoted to one another, their lives are punctuated by small concerns; what to give the sewing woman Miss Prior for her lunch, how soon to invite the new curate to dinner. The latest curate – and object of Harriet’s latest affection is Mr Edgar Donne, when Belinda considers her sister’s joy in ministering to the curates who briefly join their community, she remembers the Thomas Haynes Bayley poem; Something to Love. So, when Harriet hears that Agatha Hoccleve’s niece Olivia has been knitting socks for Mr Donne, she is a little perturbed. Soon after Agatha leaves, visiting librarians; Dr Nicholas Parnell and Nathaniel Mold arrive in the village followed not long afterward by a Bishop Theodore Grote who has been in Africa for some time, and who once met Harriet when he was just a curate. Invitations are issued and visits paid, and the social fabric of the community is somewhat unsettled by these men whose visits causes great excitement. These outsiders are quickly woven into the small group of people who surround the sisters, each of them threatening in their way to upset the comfortable way of life the sisters lead. Barbara Pym’s novels are generally described as social comedies, like Jane Austen and Elizabeth Taylor her canvases are small. Here we have a small English community of middle and upper middle-class people, their small traditions and absurdities laid bare. However, there are small sadnesses too, which I hadn’t remembered. Regrets of the past are just a little tender and Belinda is really very hard on herself. Pym’s humour which remains present throughout is gentle, clever and beautifully observed. 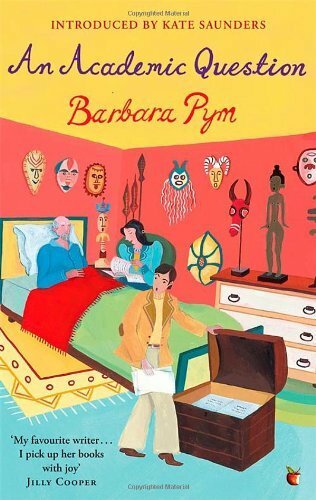 Barbara Pym was born in Oswestry, Shropshire on 2 June 1913. Making this year her centenary year. Someone over on the Librarything Virago group suggested we read her books in order of publication during 2013 – just as we had done with the work of Elizabeth Taylor in 2012. Not only did I manage to keep up with the challenge (boding well for next year’s two massive challenges) but I read biographies alongside the novels and even held a Barbara Pym tea party at my house on June 2nd. June was busy! As June was Barbara Pym’s birthday we read two novels (it was also a way of making 13 novels fit into 12 months) – but I also read A Very Private Eye – the letters and diaries of Barbara Pym. I also held a lovely Barbara Pym tea party on what would have been Barbara’s actual 100th birthday – Sunday June 2nd 2013 – there was even a Facebook group! June was also Barbara Pym reading week hosted by Thomas at My porch. • December 2013 Civil to Strangers and other writings (written 1936; published posthumously, 1989) – and I also read Barbara in the Bodleian which I has bought at the event in November. Sitting down to write this – I made a shocking discovery – I was convinced that I had re-read A lot to Ask this year, the biography of Barbara Pym written by her long-time friend Hazel Holt – but I discover I haven’t – oh well too late now – but how strange that I was so sure I had re-read it this year. I obviously intended to and didn’t get around to it. 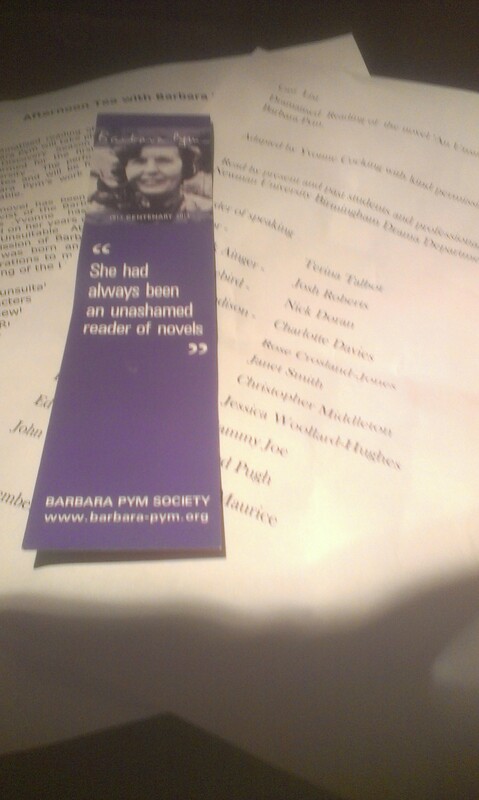 I have been asked once or twice this year to sum up Barbara Pym to someone who has never read her. I admit I struggle to do her justice; it is easy to descend into hackneyed phrases – like English comedies of manners or social comedies. Her work is much deeper than a cursory reading might make them seem. Her early novels – generally considered the Pym canon – certainly have recurring themes surrounding Anglo-Catholic ecclesiastical communities but all her work examines the relationships between men and women and their place in society, she is particularly gifted at portraying the pathos of unrequited love. Like Elizabeth Taylor – and indeed Jane Austen – Barbara Pym has a sharp eye for the everyday absurdities in life – and a marvellously keen ear for the way people of a certain class and type speak to one another. This year of Pym, for me at least, has been a real joy. Ten of the thirteen novels were re-reads for me, and I already thought I knew which would remain my favourites. My opinion of only one novel has been greatly changed. Quartet in Autumn – the novel which was published in 1977 and longlisted for the Booker prize – following fourteen years in the literary wilderness. It is very different – I had remembered it as rather bleak, and dare I say depressing. However on re-reading it in June – I realised it is utter genius, and it is now a firm favourite. My other two favourites remain Jane and Prudence and No Fond Return of Love, although I rather adore them all – and Civil to Strangers was a delight – my first reading of it this month was pure joy. Next year’s reading challenges will be underway in just a couple of weeks – and I hope they bring as much pleasure. If you read Pym this year – tell me what were your highs and lows of the year? Civil to Strangers was Barbara Pym’s second novel written in 1936 – although not published until after her death in 1980. Alongside it is some of the previously unpublished and unfinished material that she left behind her. Brilliantly edited by her friend and biographer Hazel Holt each unfinished work is perfectly satisfying – the reader is not left hanging, just wishing for a little more. Civil to Strangers – the longest piece in this collection running to almost 170 pages. Cassandra Marsh-Gibbons is a young woman, married to self-absorbed writer Adam. In the small Shropshire town of Up Callow, the Marsh-Gibbons are very much at the heart of local society which also includes Mrs Gower the widow of a professor and Mr Phillip Gay an ageing bachelor who has failed to marry a wealthy wife as had been his plan in his youth; Mr Gay shares his home with his niece Angela – who is in love with Adam Marsh-Gibbon, and has started to cast her eye at the curate. Rockingham Wilmot is the rector, living with his wife and daughter Janie. Into the small community of Up Callow comes Hungarian Stefan Tilos, who soon sets the cats among the pigeons, and gets tongues wagging when it is soon apparent that he has become instantly enamoured of dear good excellent Cassandra. Cassandra is a put upon wife, taken for granted by her husband; she isn’t entirely down trodden as she casts a weary and ironic eye at the events around her. Having had the wonders of Budapest related to her by the irrepressible Mr Tilos Cassandra decides to go – alone, leaving her husband to go and study quietly in Oxford at the Bodleian. However as Cassandra’s train pulls away she is made aware that Mr Tilos is on the same train, on his way to Budapest on business and delighted to find her aboard the same train. “But I have tea. Wait a minute, please? Mr Tilos produced a basket a sensible aunt might have, and inside were two thermos flasks, two cups and some packets wrapped in greaseproof paper. Cassandra was deeply touched at this. What an excellent and useful man Mr Tilos was, she thought, and what a pity he spoilt things by embarrassing her with his protestations of affection. It was nice to see some of Pym’s characters outside of England again (we were treated to an Italian trip in An Unsuitable Attachment). Mr Tilos manages to shake things up in Up Callow – everyone seems to get what they want and it is all truly delightful – vintage Pym definitely one to put a smile on anyone’s face I should think. Coming after Civil Strangers are three unfinished novels – edited to the length of longish short stories – and I thoroughly enjoyed them. ‘Gervase and Flora’ is set in Finland, among a group pf English ex pats and the Finnish family that Gervase lodges with. Flora who has been in love with Gervase for years is staying with her aunt, Gervase comes to Finland to teach. The daughter of the house where Gervase is lodging falls for Gervase and Flora decides to encourage the attachment while beginning anew romance with one of Gervase’s students. Then come two stories set in World War Two – ‘Home Front novel’ and ‘So very secret’ – wonderfully eccentric and full brilliant observational period detail; black out curtains, rationing, eating savoury oatmeal and feeling patriotic for doing so, the pride in a new tin hat and sandbags spilling dark soil onto the pavement. Four wonderful short stories follow, that give Pym fans the chance to meet again, Miss Dogget and Jessie Morrow from Crampton Hodnet and the Aingers and Faustina the cat from An Unsuitable Attachment – we also meet the American Ned from The Sweet Dove Died. I love the way that Barbara Pym never let a good character go to waste. The final piece is in Barbara Pym’s own words – ‘Finding a voice – a radio talk’ in which she describes how she came to find her voice as a writer. All in all I loved this collection of Pym writings which has brought my year of Pym centenary reading to a pretty wonderful conclusion. I bought this book at a recent Barbara Pym event at the new Library of Birmingham – the author of this book had produced a dramatised reading of Barbara Pym’s novel ‘An Unsuitable Attachment’ which was read by a group of drama students. I was disappointed that we didn’t get to hear from Yvonne Cocking herself, but was happy to buy her book – which I thought would be a good way of completing my yearlong centenary reading of Barbara Pym’s novels. As well as reading Barbara Pym’s novels (most of which have been re-reads in fact) this year – I also read A Very Private Eye – the letters and Diaries of Barbara Pym, and re-read A lot to Ask, the biography written by Barbara Pym’s friend Hazel Holt. Both those books provide a lot of excellent background reading for Pym fans – and I wasn’t sure if this book could possibly add all that much. Barbara in the Bodleian is made up of a collection of essays by Yvonne Cocking an archivist of the Barbara Pym society. She actually knew Barbara Pym, and in fact worked alongside her at the International African Institute. The first essay – about the International African Institute was really quite interesting, as I have often wanted a clearer idea of what the place where Barbara Pym worked for so long might have been like. The majority of the essays seem to have been presented before as papers to annual general meetings and conferences of the Barbara Pym society. These essays are based upon Yvonne Cocking’s many years of research in the Pym archives in the Bodleian library. They include extracts of letters, diaries and the notes Barbara Pym kept in her notebooks. By piecing together these excerpts Yvonne Cocking charts the development of the nine novels which were published during Barbara Pym’s lifetime – the revisions she made, and the reactions that she received from friends, fans and literary critics. We also get to see Barbara Pym in Germany in the 1930’s when she fell in love with a handsome young SS officer Friedbert Gluck. This was a very interesting essay for me – for despite having read ‘A lot to Ask’ twice – I had forgotten about this brief love affair – and Friedbert gets much less mention in ‘A very Private Eye’ – Barbara Pym – Yvonne Cocking suggests was quite likely embarrassed in later years by this relationship. I was also amused by how Barbara Pym appears to have come quite close to be being sued by Marks and Spencers – when they objected to a reference in Jane and Prudence – a reference that was later supposed to have been removed – but in fact it appears it never was. Overall however I can’t really say I particularly enjoyed this book in the way I had expected to. Pages of glowing reviews and fan letters punctuated by some of surprising spite became fairly tedious – and on the whole the book wasn’t really very revelatory at all. Many of Barbara Pym’s notes on her work show a thought process that might be of some interest to some, but these are notes and were never meant for publication, and for me there was less interest in them than I had expected. I enjoyed reading dear Elizabeth Taylor’s letter to Barbara Pym, and some of those fan letters from ordinary people were really lovely – maybe there were just too many for me. Maybe this book would appeal more to someone undertaking a particularly detailed study of Pym’s work. So aside from a couple of the essays that I have already mentioned, which did lift my interest somewhat – I did sort of plod through this book – dipping in and out of it over the period of nearly a week. This may in part be because I have had a particular problem with reading non-fiction this year – I suspect there will be others who would be fascinated by the things which I began to get bogged down by. Written mainly in the early 1970’s An Academic Question was put together posthumously by Barbara Pym’s biographer and friend Hazel Holt. Maybe because of the way it was essentially compiled – by someone else – from Barbara Pym’s drafts and notes the novel has a very different feel to it. The novel has a light, bright freshness to it and I actually enjoyed it a lot – but it is possibly the least Pymish of her novels. Certainly this novel is more rooted in academia than the Anglican Church, where so many others books are rooted, set among the various inhabitants of a small unnamed University town (although I felt it must be Bath). Caro Grimstone a sometimes bored faculty wife married to the dull slightly ambitious Alan becomes an unwitting accomplice in her husband’s machinations, when she volunteers to read to an elderly man in a care home. The Reverend Stillingfleet has a manuscript – well known about in academic circles – hidden in a box in his room at the nursing home, he has so far not allowed anyone to see it. As the Stillingfleet papers concern the very subject that ethno-historian Alan Grimstone is interested – he takes the opportunity to accompany Caro on one of her visits so he can help himself to the manuscript. Alan intends to use Stillingfleet‘s work in a paper he himself is writing. Alan is tremendously excited about the paper and what it might mean for him. Caro is instantly a little uneasy about her complicity in Alan’s theft – and later takes a part time library job in order to secrete the manuscript away with other Stillingfleet papers. The data that Alan has access to gives him a huge advantage over his academic rivals and in the run up to his paper’s publication Alan finds he has to defend his position as his rivals start to suspect the origin of his information. An Academic Question is set in a more modern world than many of her earlier novels. The world in which these characters exist feels more real, and although definitely less Pymish there are still examples of Pym’s wit, the absurdities of life which Barbara Pym always highlights so beautifully. The meshing of the modern world and the Pymish world is slightly uneasy to some Pym fans perhaps, there is an extra marital affaire; talk of abortion alongside the petty jealousies of academics, an elderly woman who keeps hedgehogs and the endless question of what to wear to dinner parties. I always love Pym’s characters – and in An Academic Question there several characters of a Pymish bent to enjoy – including the wonderful Sister Dew – who we first meet in An Unsuitable Attachment, and Dolly – the keeper of hedgehogs, and Caro’s friend Coco and his mother kitty (Dolly’s sister), constantly reminiscing about their days on “the island” – in the Caribbean from where they originally come. An Academic Question is an enjoyable novel, the difference in tone – it feels lighter as well as more modern – surely makes it interesting enough to Pym fans – however it is an enjoyable novel too. I really liked the gentle ending of this novel, the feeling of things carrying on –in a seasonal kind of way – not unlike an academic year I suppose. On Saturday afternoon Liz and I attended an event at the lovely and still sparkling new Library of Birmingham. 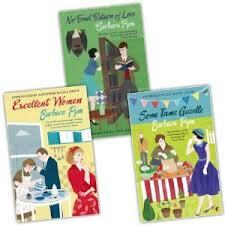 It was a ticketed event called Afternoon tea with Barbara Pym. I knew the Barbara Pym archivist Yvonne Cocking was involved with it, and that there would be a dramatised reading of Pym’s work. I obviously had then misunderstood what the event was – because somehow I had understood that there would be a talk by Yvonne Cocking, I was looking forward to it. Yvonne Cocking was there – however she didn’t speak. In fact Yvonne Cocking had adapted the novel ‘An Unsuitable Attachment’ for a dramatised reading by local drama students. What I had assumed would be readings of short extracts turned out to be a dramatised reading of the entire (abridged of course) novel. I had to smile to myself – wondering whether any of the students had even heard of Barbara Pym before being sent the script. 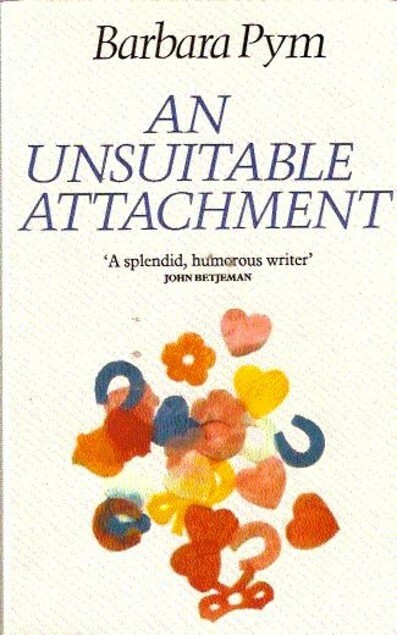 An Unsuitable attachment is actually really quite a humorous novel- which I thoroughly enjoyed when I read it recently – and it lends itself to being read aloud by a cast of actors rather well. I particularly liked the performances of the young men playing the parts of Rupert Stonebird and Mervyn Cantrell. At the end of the performance – which was about an hour and twenty minutes or so – we were treated to tea and scones – there were cakes too – served on nice little tiered cake stands – and more than enough to go around. I can report there were no unseemly fights over the tea urn –just a long line of patiently waiting Pym fans fairly determined to get their tea. 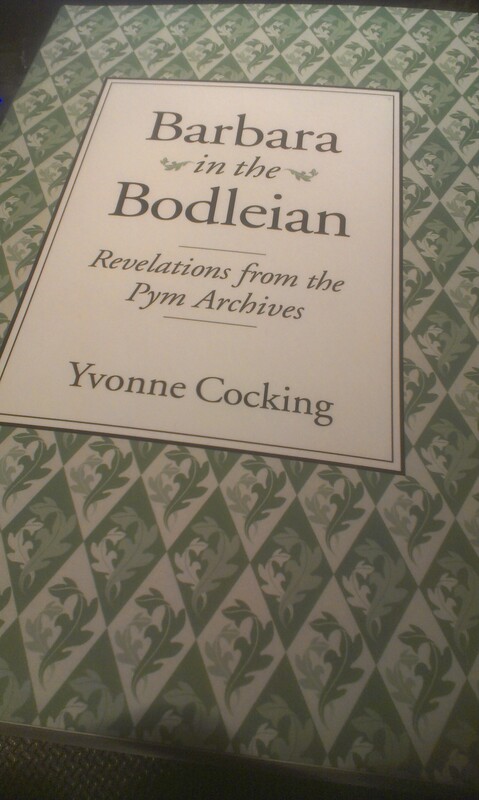 The one extravagance of the afternoon was the purchase of Yvonne Cocking’s book – published by the Barbara Pym Society – Barbara in the Bodleian: Revelations from the Pym archives – well I had to didn’t I? 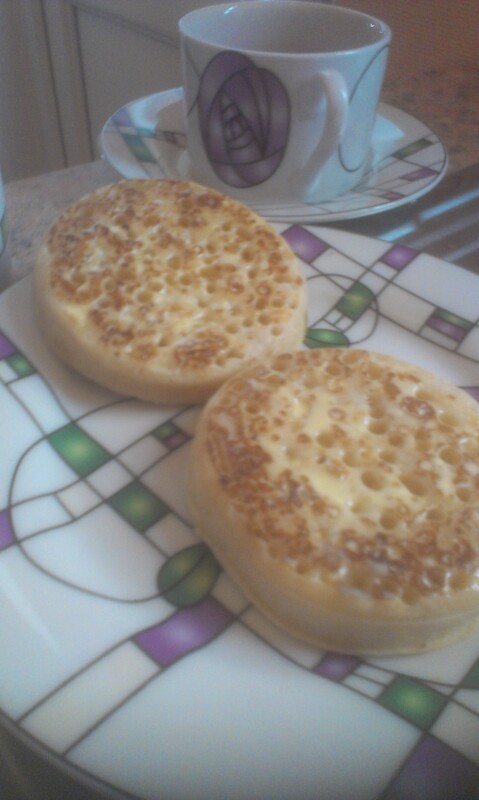 Actually it looks rather good. All in all it was an enjoyable afternoon, and so marvellous to see that it was sold out – there are just so many Pym fans out there. The latest read in the Librarything Virago group Barbara Pym read-a-long is An Unsuitable attachment. Published in 1982 two years after her death, it was actually written in the early 1960’s – and was rejected by Cape in 1963, this was the beginning of the period when Barbara Pym was unable to get published. Inexplicably Barbara Pym found herself in the literary wilderness, having been widely popular for ten years – publishing seven novels – suddenly she was no longer wanted. Hurt and confused as she was, Pym never gave up writing. Thankfully in 1977 when both Philip Larkin and Lord David Cecil independently of each other named Barbara Pym as being one of the most underrated novelists almost overnight Barbara Pym found her work back in vogue. In his forward to my little Granada edition Philip Larkin maintains that due to its “undiminished high spirits” we should regard ‘An unsuitable Attachment’ as belonging to Pym’s “first and principal group of novels.” As always Barbara Pym is wonderful at highlighting those small everyday absurdities; such as buying fish and chips for one’s wife and her cat. An unsuitable Attachment is recognisably Barbara Pym – clergymen, anthropologists, librarians and spinsters concern themselves with who may or may not fancy who and whether they are “suitable” all set against a backdrop of an Anglican Church year. Anthropologist Rupert Stonebird a single man in his mid-thirties moves to a house in a North London suburb, close to the church of St. Basil and close too, to the home of Vicar Mark Ainger, his wife Sophia and their cat Faustina – upon whom Sophia lavishes an increasingly ridiculous amount of attention. Sophia immediately considers Rupert as being a potentially suitable husband for her younger sister Penelope. However also new to the street is Ianthe Broome the daughter of a Canon and niece to an Archdeacon, a librarian, who is at the centre of the Unsuitable Attachment of the title. The young man for who Ianthe nurses an affection is John, who works with her at the library – he is five years younger than her, lives in a rented bedsit in the wrong part of London, isn’t even a fully qualified librarian and then borrows money from her. All this is supposed to demonstrate how very unsuitable John is – but somehow this unsuitable relationship never really feels unsuitable enough to justify the title. Philip Larkin wryly suggests that the true unsuitable attachment in the novel could be that of Sophia and her cat Faustina – I like that idea. Unusually for Barbara Pym, in this novel she takes her characters away to Rome – where the group run into a young clergyman who was once Ianthe’s father’s curate, who is accompanying two elderly sisters, named the Misses Bede (Some Tame Gazelle) on a tour of the city. The re-appearance of characters from previous books is certainly something Pym readers are used to – and there are plenty to spot in this one. 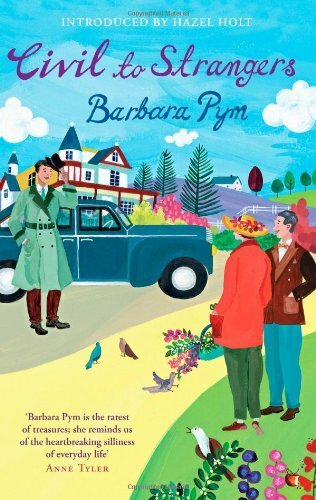 Although not Barbara Pym’s best novel – it is still an enjoyable read – you know where you are with Barbara Pym, and I really like that, there is something recognisably comforting and reassuring about Pym’s world, that I will probably never really tire of.